Perfect for the elderly or disabled. 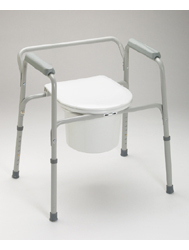 You can also remove the bucket and place the commode over the toilet. Great for those recuperating from surgery or with knee problems.